This species is accepted, and its native range is SE. Kenya to KwaZulu-Natal. Shrub or small tree 1.8–18 m. tall with glabrous branches; bark pale grey-brown, described as rough or smooth; twigs densely lenticellate. Leaves often drying grey-green; petiole slender, 2.5–15 cm. long, thickened at base, glabrous; rhachis 6–12 cm. long; petiolules 5–7 mm. long; leaflets in (2–)3–5 pairs, rarely 2 but probably always some with more (see note), oblanceolate to broadly elliptic-oblong, obovate or elliptic, 5.5–27+ cm. long, 1.7–7(–12) cm. wide, rounded to subacute or distinctly acuminate or rarely emarginate at the apex, cuneate at the base, glabrous. Inflorescences axillary and on the older wood, narrowly thyrsoid with single flowers or subsessile ± 3-flowered cymules spaced at intervals, ferruginous pubescent; male 2–20.5 cm. long, pedicels 0–2.5 mm. long; female mostly shorter, 2.5–5(–7) cm. long, pedicels 2–2.5 mm. long (in Flora area – 5–7 mm. in Natal). Male flowers:calyx-tube 1–2 mm. long, lobes triangular, 2–3 mm. long, velvety brown-pubescent outside; petals white or cream, obovate, the limb 2 mm. long and wide, scale bilobed, with a pair of simple or forked ligulate appendages; disk semicircular; stamens 8 with pilose filaments 7 mm. long. Female flowers:ovary 1.8 mm. long, ferruginous pubescent; style and stigma 3 mm. long. Male flowers:calyx-tube 1–2 mm. long, lobes triangular, 2–3 mm. long, velvety brown-pubescent outside; petals white or cream, obovate, the limb 2 mm. long and wide, scale bilobed, with a pair of simple or forked ligulate appendages; disk semicircular; stamens 8 with pilose filaments 7 mm. long. Female flowers:ovary 1.8 mm. long, ferruginous pubescent; style and stigma 3 mm. long. Fruit orange-yellow, with 1–3 mericarps developing, joined for up to 2/3 their length, each ellipsoid, compressed, 1.5–2 cm. long, 1.1–1.5 cm. wide, up to 1.1 cm. thick, sometimes only one developing then other 2 remaining at its base, ± 6 mm. long; pedicels ± 3 mm. long. Seeds pale brown or dark, compressed ellipsoid, 1.2–1.8 cm. long, 0.8–1.3 cm. wide, up to 8 mm. thick. Slender tree c. 15 m. tall or shrub; branchlets fulvous-tomentellous at first, soon glabrescent. Leaves c. 5 cm. long; petiole up to 3 cm. long, glabrescent; leaflets 2–5-jugate; petiolules c. 3·5 mm. long; rhachis slightly ridged, glabrescent; leaflet-lamina up to 14 × 3·5 cm., narrowly oblong-elliptic, chartaceous, glabrous, with sparse bulbous glands on the reticulation of the under surface, apex rather gradually acuminate, margin entire, base narrowly to broadly cuneate; lateral nerves 10–13 pairs. Inflorescence 3–10 cm. long, usually a racemoid thyrse. Sepals 4–5, c. 4 mm. long, connate to halfway or further. Petals 4, 3 mm. long; lamina 1·5 × 1·5 mm., broadly triangular; claw 1·5 mm. long. Stamens 7–9; filaments 5 mm. long; staminodes shorter in female flowers. Fruit 1–3-coccous; cocci 9–12 × 5–8 mm., ellipsoid, fulvous-tomentellous, ± glabrescent. Seed 10–11 × 5–7 mm., flattened-ellipsoid, glabrous. 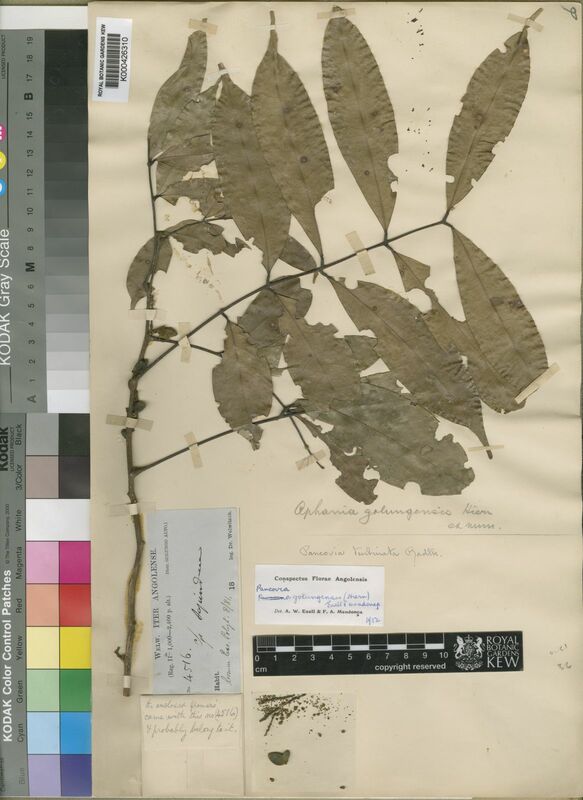 Beentje, Kenya Trees, Shrubs and Lianas p. 422, fig. (1994). Exell in Flora Zambesiaca 2: 525, t. 109 (1966) pro parte excl. spec. White 3729. Exell & Mendonça, Consp. Fl. Angol. 2: 85 (1954).